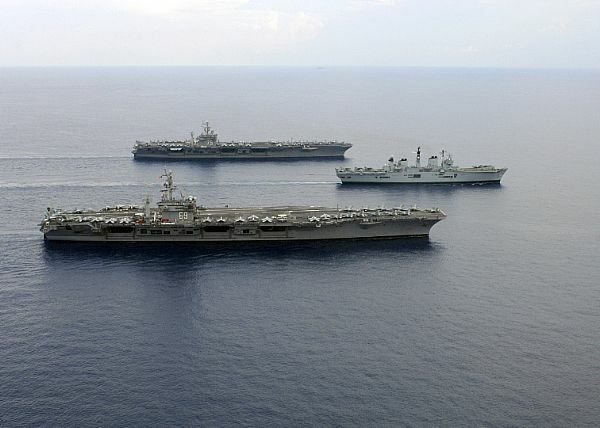 ATLANTIC OCEAN (July 29, 2007) - Nimitz-class aircraft carriers USS Dwight D. Eisenhower (CVN 69), USS Harry S. Truman (CVN 75) transit in formation with the Royal Navy's Invincible-class aircraft carrier HMS Illustrious (R 06) in the Atlantic Ocean. The three carriers are currently participating in Operation Bold Step where more than 15,000 service members from three countries partake in the Joint Task Force Exercise (JTFX). U.S. Navy photo by Mass Communication Specialist 2nd Class Jay C. Pugh. ATLANTIC OCEAN (July 29, 2007) - The Royal Navy Invincible-class aircraft carrier HMS Illustrious (R 06), and Nimitz-class aircraft carriers USS Harry S. Truman (CVN 75) and USS Dwight D. Eisenhower (CVN 69) transit in formation during a multi-ship maneuvering exercise in the Atlantic Ocean. U.S. Navy photo by Mass Communication Specialist 2nd Class Jay C. Pugh. HMS Ark Royal (R 07) leaving Portsmmouth harbour, 12/10/2007. 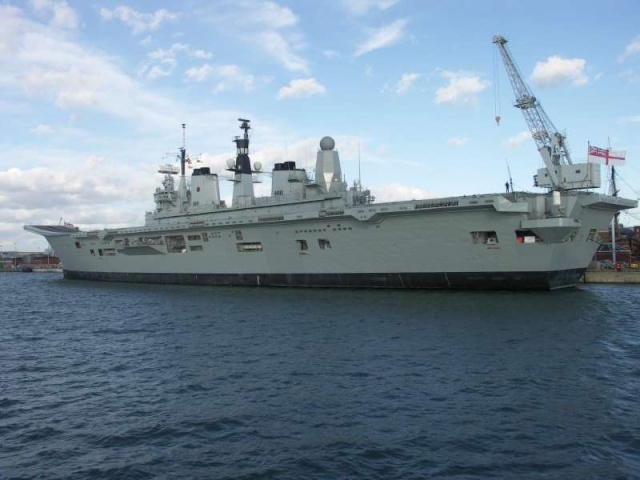 HMS Ark Royal (R 07) in Portsmouth harbour, 29th October 2007. 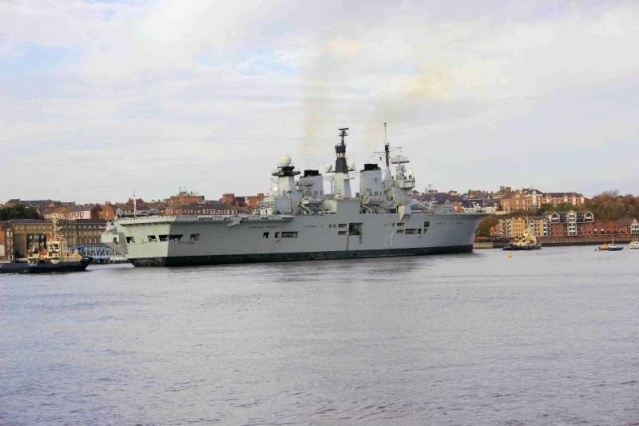 HMS Illustrious (R 06) leaving the River Tyne, 04-11-2007. 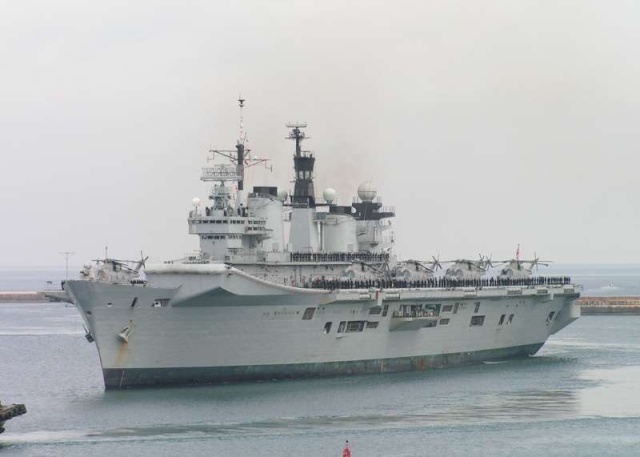 The aircraft carrier HMS Illustrious departs Portsmouth on Monday 21st January 2008 to lead a multi-national Task Group to the Indian Ocean region for exercises over the next four months. The Task Group incorporates more than 2,500 personnel, 13 ships, a nuclear powered submarine and fixed wing and rotary wing aircraft. Orion 08 is an element of the UK’s continued commitment to boosting peace and stability in the area by exercising with a number of navies in the region. During its deployment the Task Group will be visiting 20 ports in the Mediterranean, Africa, Middle East, South Asia and the Far East. 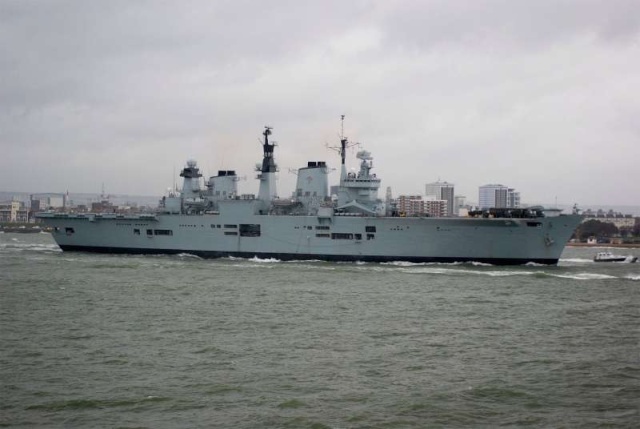 The deployment is part of the RN’s regular operating pattern, repeating a similar deployment to the Indian Ocean in 2006. It will exercise deploying a maritime strike force for a prolonged period away from the home base and working with allies. During the deployment, the ship will carry Ground Attack Harriers flown by Royal Navy and RAF pilots from the Naval Strike Wing and No 1 (Fighter) Squadron Royal Air Force, both part of the UK’s Joint Force Harrier. Also on board will be Merlin Anti-Submarine Warfare Helicopters from 814 Naval Air Squadron. Units in the group include the Air Defence Destroyer HMS Edinburgh, the multi-role Frigate HMS Westminster, the nuclear powered submarine HMS Trafalgar, and Royal Fleet Auxiliaries Wave Knight, Fort Austin, Diligence and Bayleaf (carrying fuel, ammunition, stores and food). Also working with the Task Group are USS Cole (an American Arleigh Burke Destroyer), SNS Mendez Nunez (Spanish F100 class Aegis Frigate), FS Jean Bart (French air defence destroyer), supported by UK Mine Countermeasures Vessels HM Ships Chiddingfold and Atherstone. 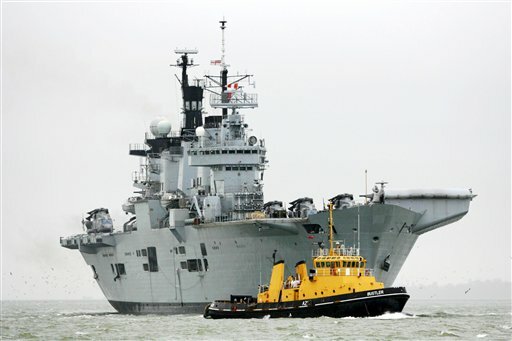 Royal Navy aircraft carrier HMS Illustrious left Portsmouth today, Monday 21 January 2008, to lead a multi-national Task Group to the Indian Ocean region for a series of exercises which will take place over the next four months. The Task Group incorporates more than 2,500 personnel, 13 ships, a nuclear powered submarine and fixed wing and rotary wing aircraft. 'Orion 08' is an element of the UK's continued commitment to boosting peace and stability in the area by exercising with a number of navies in the region. During its deployment the Task Group will be visiting 20 ports in the Mediterranean, Africa, Middle East, South Asia and the Far East. 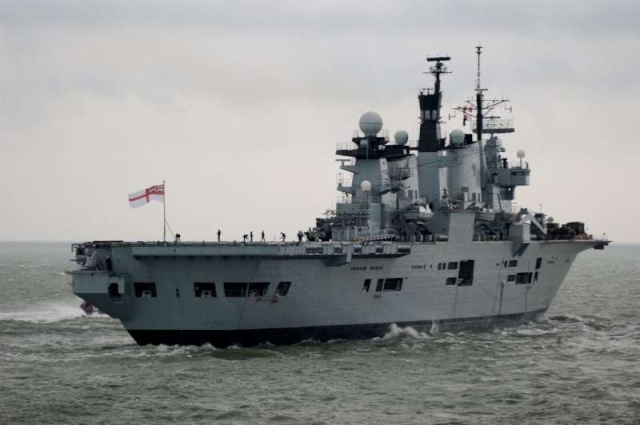 The deployment is part of the RN's regular operating pattern, repeating a similar deployment to the Indian Ocean in 2006. It will exercise deploying a maritime strike force for a prolonged period away from the home base and working with allies. During the deployment, the ship will carry Ground Attack Harriers flown by Royal Navy and RAF pilots from the Naval Strike Wing and No 1 (Fighter) Squadron Royal Air Force, both part of the UK's Joint Force Harrier. A total of 20 fixed-wing and rotary aircraft, including six Merlin helicopters from 814 Naval Air Squadron (the 'Flying Tigers') based at Royal Naval Air Station Culdrose in Cornwall have deployed with the Task Group. "Orion 08 is a great opportunity for the RN to demonstrate one of its core capabilities. The ships' companies and support networks have been working tremendously hard to get the ships to sea on time and we are now all looking forward to this deployment which will allow us to further develop Joint Force Harrier operations and UK relationships in this important region." Units in the group include the Air Defence Destroyer HMS Edinburgh, the multi-role Frigate HMS Westminster, the nuclear powered submarine HMS Trafalgar, and Royal Fleet Auxiliaries Wave Knight, Fort Austin, Diligence and Bayleaf (carrying fuel, ammunition, stores and food). Also working with the Task Group are USS Cole (an American Arleigh Burke Destroyer), SNS Mendez Nunez (Spanish F100 class Aegis Frigate), FS Jean Bart (French air defence destroyer), supported by UK Mine Countermeasures Vessels HM Ships Chiddingfold and Atherstone. HMS Illustrious (R 06) leaving Portsmouth harbour, 21-01-2008. 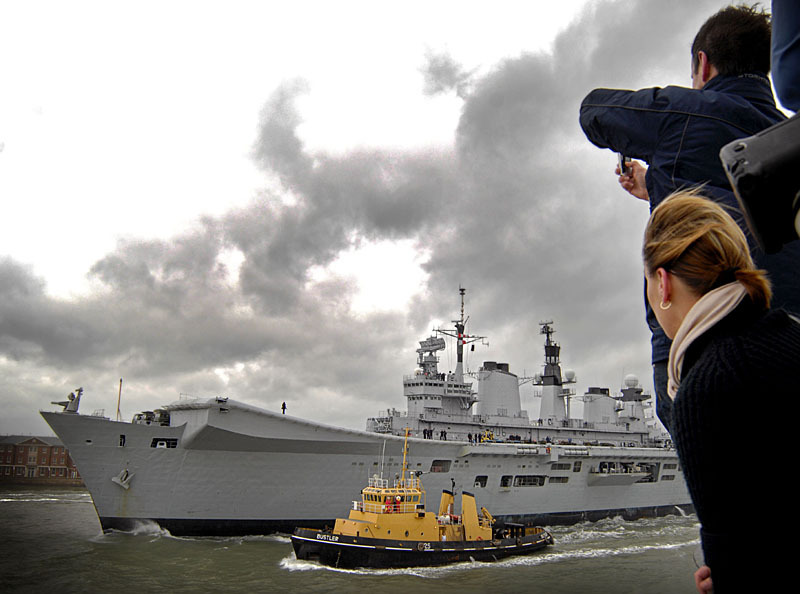 The Royal Navy aircraft carrier HMS Illustrious returns to Portsmouth, England, Wednesday Jan. 23, 2008, just two days after she left to start a four month tour of the Indian Ocean. 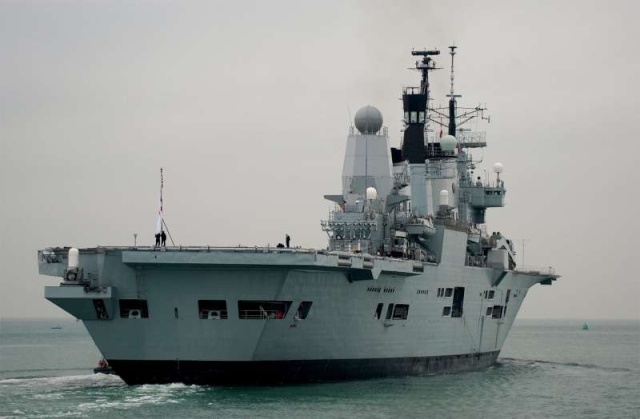 A faulty meat refridgerator is forcing the return of the carrier, which left Portsmouth Naval Base on Monday to head the multi-national Task Group Orion 08 which will be carrying out exercises and diplomatic visits during the next four months in the Indian Ocean and Mediterranean. Une chambre froide menace de tomber en panne et voilà l'un des plus grands bâtiments de la flotte britannique rebroussant chemin, trois jours après son départ pour un déploiement de quatre mois en océan Indien. 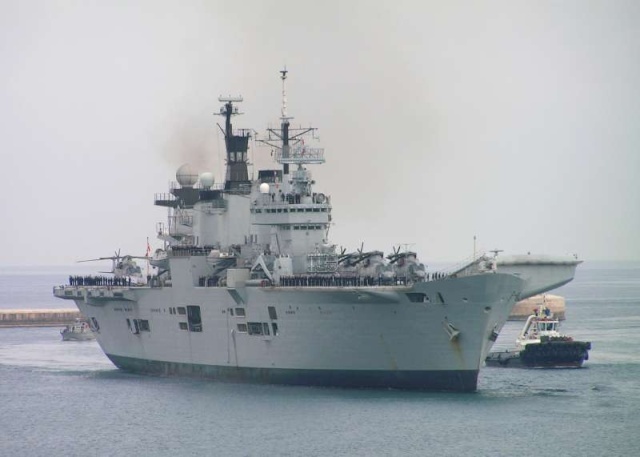 Le porte-aéronefs HMS Illustrious, qui avait quitté Portsmouth lundi, a retrouvé prématurément sa base hier. Le motif du retour du bâtiment a beaucoup amusé la presse anglaise. En effet, aucune avarie majeure n'est à signaler, si ce n'est une chambre froide des cuisines, jugée défaillante. Destinée à stocker la viande consommée par l'équipage, ce frigo menaçait de tomber en panne. 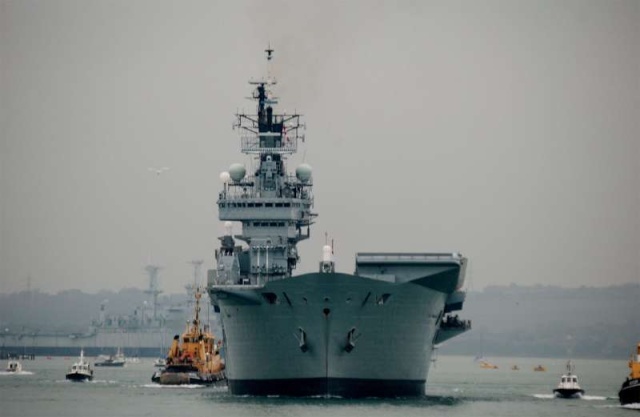 La Royal Navy a donc jugé plus sage, temps que l'Illustrous était encore à proximité des côtes britanniques, de le rapatrier pour effectuer les réparations nécessaires. En effet, si l'unité de réfrigération avait lâché en plein océan Indien, la situation aurait été beaucoup plus délicate. Le transfert sur le navire d'une équipe de technicien aurait été compliqué et onéreux, sans compter le mécontentement des marins, privés de viande et cantonnés aux conserves pour éviter une intoxication alimentaire générale. 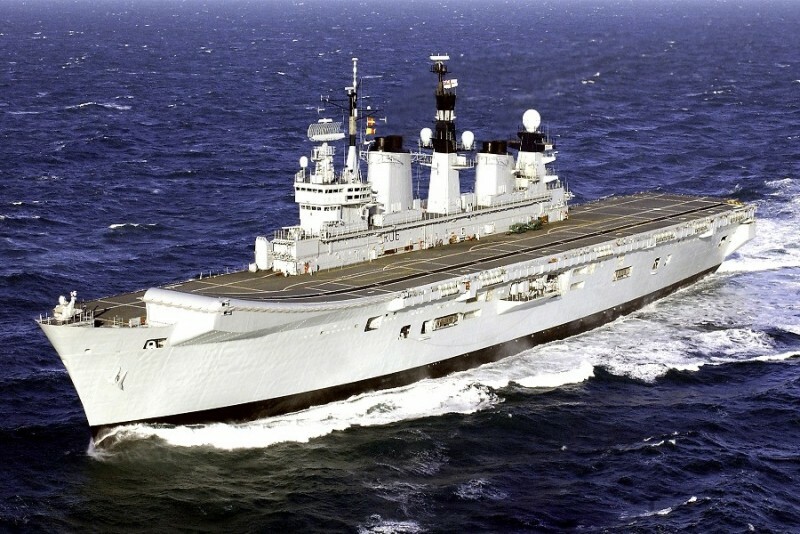 Le HMS Illustrious est chargé de conduire la mission Orion, durant laquelle il naviguera en Méditerranée et en océan Indien. Le porte-aéronefs sera accompagné du destroyer Edinburgh, de la frégate Westminster, du sous-marin nucléaire d'attaque Trafalgar, du ravitailleur de combat Fort Austin, des pétroliers ravitailleurs Wave Knight et Bayleaf, ainsi que des chasseurs de mines Chiddingfold et Atherstone. Plusieurs navires étrangers se joindront à cette force. Ce sera le cas de la frégate française Jean-Bart, du destroyer américain USS Cole et du destroyer espagnol Mendez Nunez. La participation du Jean Bart avait été révélée par le Portail des sous-marins. 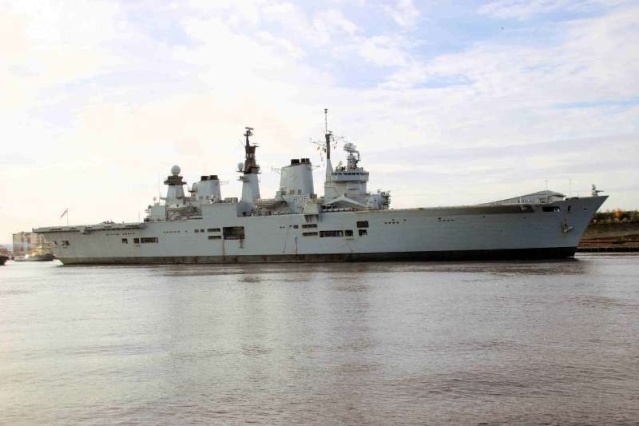 HMS Ark Royal (R 07) berthed at the Northumbrian Quay, Tyne River on the 09-02-2008. 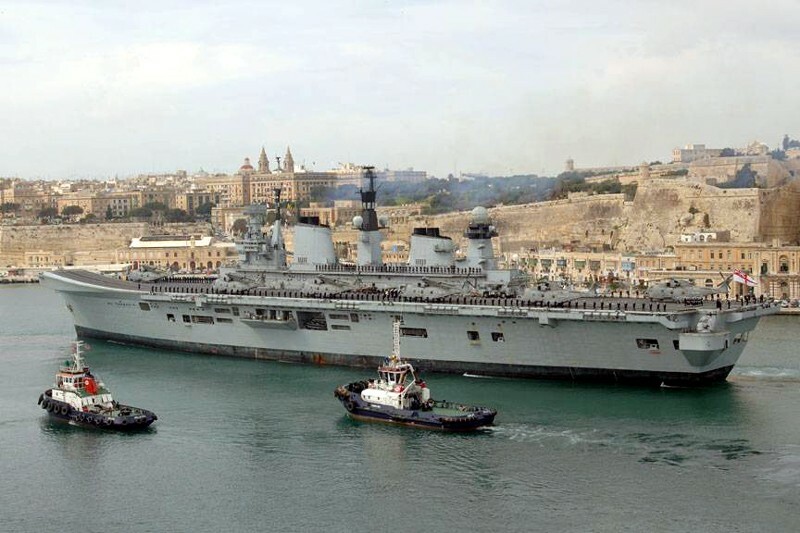 HMS Illustrious (R 06) on a visit to Malta on 26/2/08. After a fantastic visit, and leaving her newly twinned 3 cities behind, Illustrious sailed from Malta on Friday 29th February 08 to continue her Orion 08 deployment. The Ship’s Company enjoyed a wide range of events, involving a wreath laying, a charity building project, a number of ship visits and several sporting fixtures. 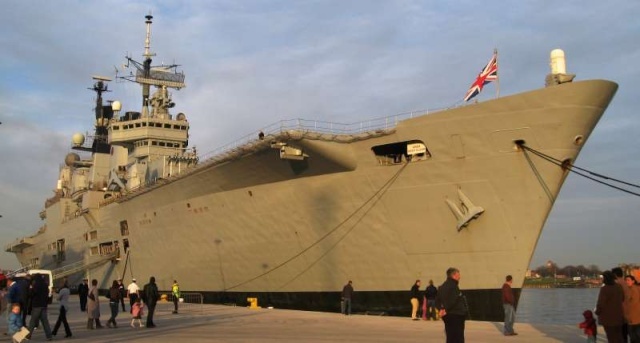 As expected, the Ship is already looking forward to coming back and continuing to nurture the special relationship that exists between Illustrious and Malta. Orion 08 is a multi-national maritime Task Group centred on the Royal Navy strike aircraft carrier. 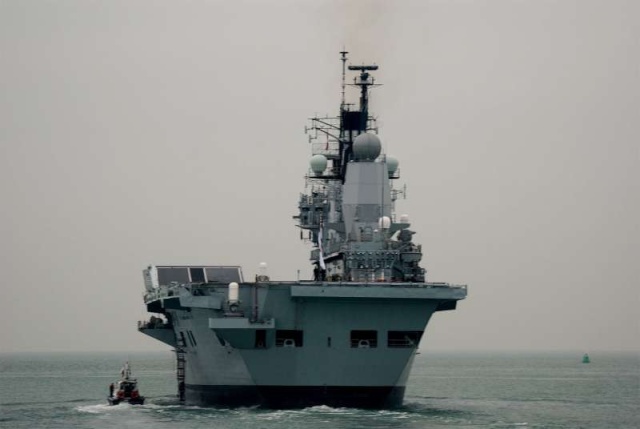 Deploying from the UK to the Indian Ocean, the task group consists of more than 2,500 personnel, 13 ships, a nuclear powered submarine, Harrier jump jets and Merlin and Lynx helicopters. 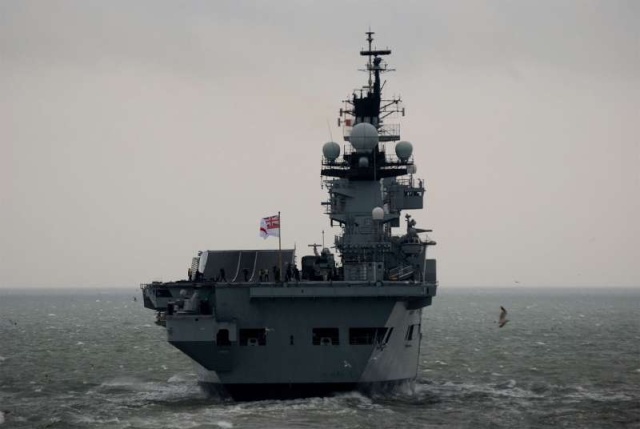 The French, Spanish and US Navies are all contributing ships and aircraft to the group, which is under the Operational Control of the Royal Navy. Orion 08 will demonstrate the UK’s continued commitment to boosting peace and stability in the region by working with a number of partner navies. During its deployment the task group will be visiting ports in the Mediterranean, Africa, Middle East, South Asia and the Far East. Exercising its ability to deploy globally, the Task Group shall conduct a wide range of training activities including anti-submarine warfare and ground attack support from Harrier Aircraft. In addition, it will contribute towards international efforts to promote maritime security in the region. The Task group is commanded by Commodore Tom Cunningham Royal Navy. 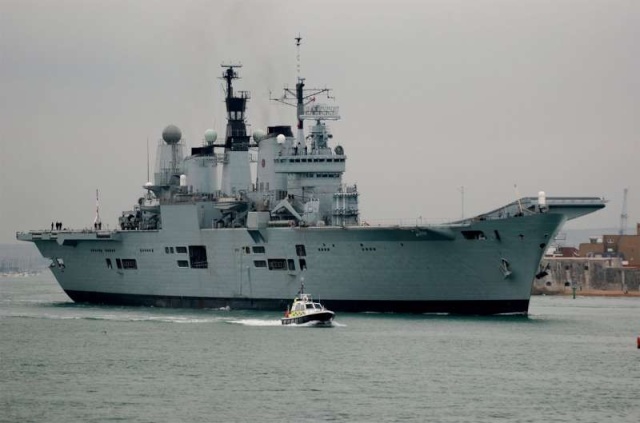 Hundreds of family and friends gathered early Friday morning on the quayside at Portsmouth Naval Base to welcome home loved ones serving on board the Royal Navy aircraft carrier HMS Illustrious. The aircraft carrier is the star of a six part Channel 5 TV series “Warship” which is gaining viewers each week on Monday nights at 9pm. The observational series follows the life on board the warship over a four month period on the deployment known as Orion 08 operating in the Indian Ocean. She was accompanied by the American destroyer USS Cole which escorted her throughout the deployment. The deployment Orion 08 was designed to demonstrate the UK’s ability to globally deploy a Carrier Strike Group for extended periods. 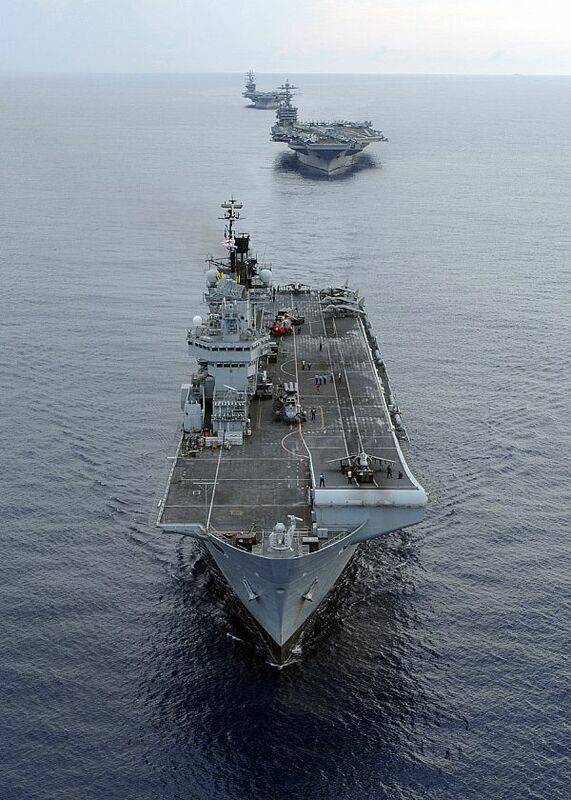 The Task Group contributed to coalition operations and took part in several challenging exercises in the Indian Ocean as part of the UK’s commitment to the region. Other highlights included a twinning ceremony with Malta’s ‘Three Cities’ in February, and more recently a Royal reception in Istanbul where the team had the privilege of welcoming on board Her Majesty The Queen and His Royal Highness The Duke of Edinburgh. 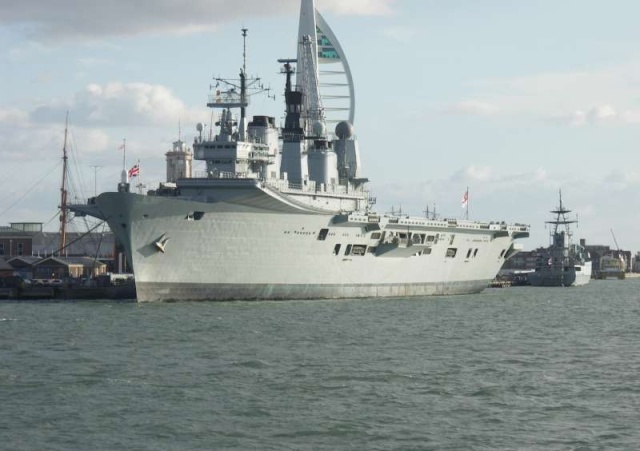 HMS Illustrious’ Commanding Officer, Captain Steve Chick, said: “It’s great to be back home in Portsmouth after a busy and challenging deployment. Orion 08 has enabled us to hone our skills through several exercises with key allies, while also supporting ongoing coalition operations. The first full squadron Merlin helicopter embarkation has been achieved as well as a successful embarkation of Harriers from the Naval Strike Wing. 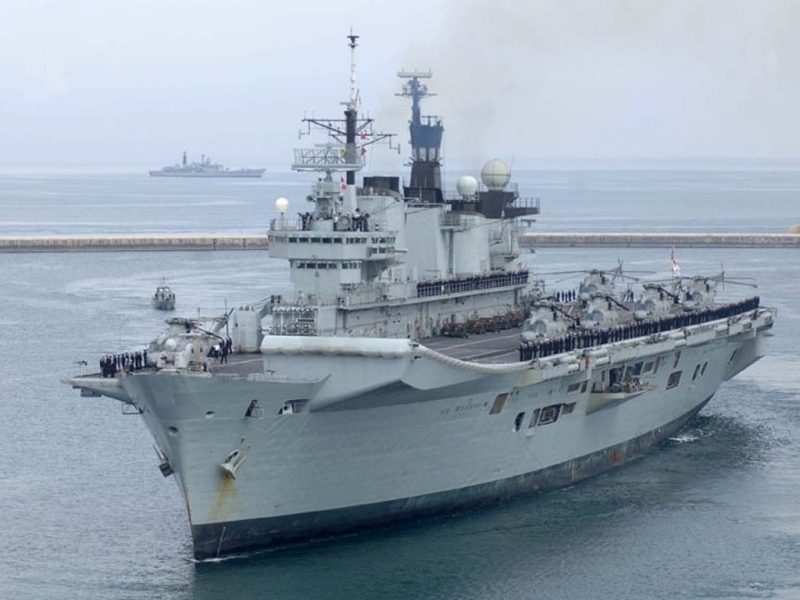 Joining the crew for the homecoming were more than 80 parents and children who boarded Illustrious in Gibraltar for the last leg of their 15,000 mile journey, giving them the opportunity to understand what their loved ones do at sea. Orion 08 involved more than 2,500 personnel, 13 ships, a nuclear powered submarine, Harrier jump jets and Merlin and Lynx helicopters. The French, Spanish and US Navies all contributed ships and aircraft to the group. Several blasts of the Ship’s sirens announced that the Fleet Flagship had arrived in the city of culture, Liverpool. 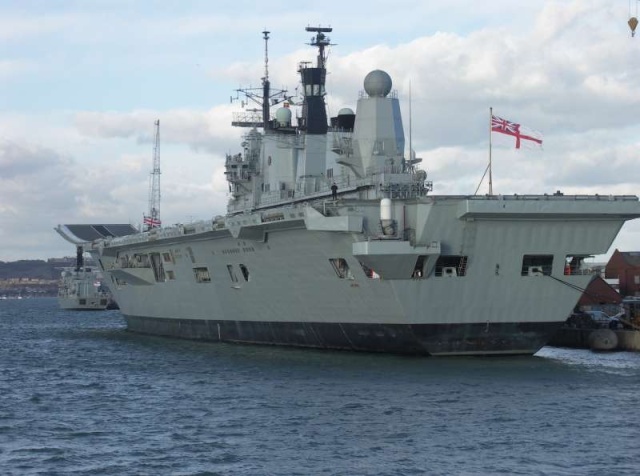 It was the first time in the Ship’s 23 year history that she had been to the city and it was clear from the number of people lining the river banks that the people of Liverpool were pleased to welcome the Royal Navy to their city. The ship berthed on Liverpool’s new Cruise Liner Terminal, right in the centre of the city with the Liver Building as a backdrop. The following morning the Ship prepared to welcome the city of Liverpool on board. It soon became clear that the level of interest was exceptionally high. By the end of the day over 5000 people visited Ark and the demand was so high that the queue was closed early afternoon to prevent disappointment. Visitors to the Ship gained an appreciation of life on the ocean waves and how the modern Royal Navy operates. Over £2000 in donations was collected for Naval charities from collection tins left on each gangway. And as well as members of the public, the ship hosted visits from a number of other groups such as Crosby Air Training Corps, the Mersey Naval and Maritime Society and local schools including Millfields Primary and Monksdown Primary. After a highly successful four days alongside it was time once more to set sail. Thousands of people then lined the streets of Liverpool, and the banks of the Mersey, to wave the ship on her to the Isle of Man. 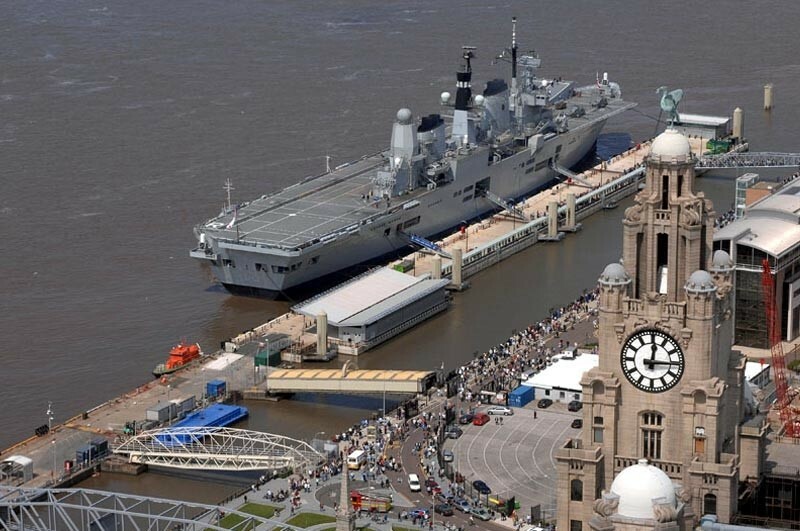 HMS Ark Royal’s Commanding Officer, Captain Mike Mansergh, said: “Our first visit to Liverpool has been a huge success. The Royal Navy always receives a warm welcome from the city and my ship’s company and I have thoroughly enjoyed our stay. Ark Royal’s final task in the North before sailing back out to the Irish Sea to continue with her operational flying training with 702 Squadron was a quick stop in Douglas Bay, becoming the first aircraft carrier to be seen off the coast of the island in over a decade and dropping off some of the island’s VIPs, including the Lieutenant Governor, the President and the Chief Minister.